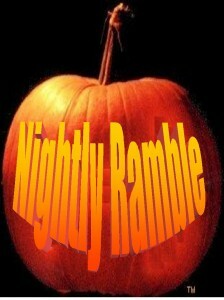 Welcome dear reader, to the most intense nightly read on the ‘sphere… BitsBlog’s Nightly Ramble. It’s Halloween. Around here that means a bunch of kids wearing their new costumes, which you’d never notice unless they took their coats off It’s a bit warmer than usual tonight, so maybe this year will be different. . Only a couple days left ’till the election. Lots to discuss. Let’s get to it. it’ll be an unexpected upset bigger than Dewey v. Truman. Well, no, Bruce, because that phrase assumes we were getting the truth of the polling, all along. If McCain does win, I suspect there’s going to be a lot of back and forth about the accuracy of the polls and the discussion on the bais of the MSM will be renewed as well. The prevailing attitude, even in Cleveland, this morning is if we elect this socialist, we deserve everything we get. Amazing given the politics out there. I like the area there, I really do… but I have to tell you their politics, particularly in the downtown areas of Cuyahoga Cty make california seem placidly sane, sometimes. In discussing this with a few folks online this morning, one thing pops out, though… and it’s worth considering; Pollsters, even Democrat pollsters, when gathering their numbers, tend to stick to people who can legally vote. Given the level of vote fraud we already know about, it seems to me reasonable to suggest that the final outcome of the voting may be altered by illegal votes. We’ll see how this pans out. Why does anyone care what Francis Fukuyama thinks on ANY topic? Remember that thing out in west LA where they had an effegy of Sarah Palin hanging by a rope? Remember what I said about replacing it with an effegy of Obama, and see what happens? Well… Case in point. Do you understand the levels of double standard being applied, here? The price of oil, as we predicted here, continues to fall . And yes, to answer some feedback, I know I’ve been harping on this. But keep in mind, I’ve only mentioned this topic about one tenth as many times as I was told I was full of it on the subject. Coleman has sued Franken for defamation . A reasonable response, actually. I’d have decked him. I see Cindy Sheehan’s HQ was ripped up a bit . I see the fine hand of Pelosi supporters in this. Fine, though, let them tear each other apart, and hopefully, we’ll see Pelosi get pulled down over it. After years of trying to create a reseccsion when one really didn’t exist, the Democrats finally have something they can point to. Yeah, it’s still not a resession, (You’d need another month like that to qualify, in reality) but they’re desperate. What’s fact when they’ve got an election to win? This one actually made it to the ‘Snark of the day” list for today…. speaking of the half-hour Obama-mercial… All Sham, no Wow…. Which really is our take on Obama himself. I repeat what I said last night, folks;Remember this.. That whole thing last night… those half hours he bought on those networks… wouldn’t have been possible, had he not broken his promise about public financing. Given that, why should anyone trust anything else he says? You’re right, Andy . Kurtz deserves huge kudos for his work.